When it comes to processing contemporary history, especially events which have become a burden,itispossibletodifferentiatethree dynamics. First of all, generally during a relatively shortperiodafterthepastsituation,comesa sensation of being overwhelmed, with emotionalised expressions of affirmation or rejection. This gives way to a cooler period of coming to terms with the past, relying heavily on facts rather than emotions in most cases. And thirdly, quite frequently at a much later date, a dialogue may take place, an exchange of information, a debate attempting to relate factual history and individual experience. The specific is brought to the forefront at the expense of the universally valid (whatever that might be). Events which happened to individuals may be comparable in historical terms, but the effect is de facto a mixture of extremely special and highly specific occurrences and circumstances. How long it can take until the narrative wins out, in complexity and ambivalence, over the historical events – this can be seen as much in the dramas of the 20th century as in stories of abuse in private life. The more unwavering the gaze, the richer the text. 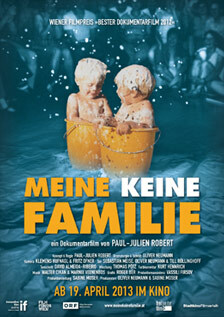 In this respect, despite the relatively short distance involved, the autobiographical text on film which Paul-JulienRobertpresentswith „MYFATHERS,MY MOTHER & ME“ is quite dizzying in its richness. It is interesting to speculate how somebody not associated with recent Austrian history and the arts in that country would respond to this narrative about Mühl’s commune at Friedrichshof and the ecstatic communards, with their devotion to the common good: the film actually only provides a limited amount of factual background. At times it appears like a story of dance movements and costumes set in the not so far distant past – remote yet at the same time quite close to us. But what factual information could be provided if the director and author wasn't even 100% sure who his biological father is/was? His childhood was spent at Friedrichshof, where he seems to have been looked after by so many people that at some point the feeling of security slipped out of sight. Paul-Julien Robert asks his mother about this, and it is astonishing how openly she responds, even though she still doesn't manage to discard the blinkered view. He questions former communards, whose lives after Friedrichshof are in some cases as strange and eccentric as the circumstances under which this community came into being. And then he consults film footage where we can see what it all may have meant: action therapy, the emptying of the self, joint efforts towards the greater whole, which may well have constituted nothing more than a sphere of activity for a huge personal and artistic dictator by the name of Otto Mühl. At the end of the film Robert and his mother sit in the screening room, and rather than showing the screen, the camera points at them. We realise how draining the recently revealed footage is for the protagonists/narrator. We see the mother’s anxious expression. Yes, „MY FATHERS, MY MOTHER & ME“ is (also) a very emotional film, but it does not attempt to dictate how a story – its story – should be read. And in a sense it sketches something far greater than just a chapter in contemporary history: something like the suggestion that we can't simply choose who places us into this world... but our view of the world – that‘s something we can shape for ourselves. © 2013 Freibeuterfilm KG. All rights reserved.